the percentage increase in input is higher than the percentage increase in output. Types of diseconomies of scale are set out below. Management problems: When a firm grows beyond a certain limit it becomes less flexible and difficult to carry out the management functions like coordination, control, communication etc. Labour problems: Vast labour force, long chain of command and wider span of control make it difficult to obtain cooperation of individual workers. It refers to the disadvantages experienced by the whole industry when it expands beyond its optimal size. 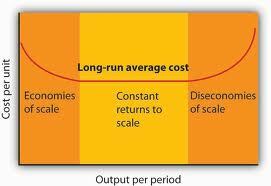 Growth of larger firms leads to diseconomies of scale because of the increased demand for the factors of production which pushes up the prices of them and the cost of production as well.